What social causes are most important to you? As a child, I was the victim of two house fires and was left homeless as a result. Because of this, I’ve dedicated my time and resources to making a difference in the lives of homeless families. What charity do you support – and how? I established Lights On Foundation early in my NFL career to help fight homelessness and host annual events to benefit the cause. One event is my annual coat drive which is going on its 11th year. Lights On Foundation has been able to collect over 20,000 garments through this event, which have been donated to members of the Maryland and Washington D.C. communities where I grew up. 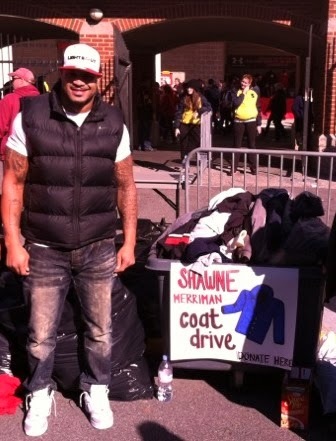 Our upcoming coat drive will be held November 23rd prior to the University of Maryland vs. Boston College game. Lights On Foundation has also held an annual charity bowling event with friends, celebrities and members of the community participating in raising money for the Foundation. The event has always been extremely successful and has helped to provide food, clothing, and shelter to children and families in need. Why do you have a passion for this one in particular, is there a personal tie? Giving back to my community that supported me through tough times is very rewarding. Having spent time in homeless shelters as a kid, I understand how this impacts your life and want to do what I can to ensure children and families never have to go through this. Is there a particular way you would want to encourage readers to be involved? Identify what causes mean the most to you personally and research how you can become involved. Giving back doesn’t necessarily mean writing a check; donating your time to help plan charitable events or work with at-risk youth can be just as impactful. How would you define social responsibility? I would define social responsibility as recognizing that there is something we can all do to help others less fortunate and taking action. I’ve been able to use my platform as an NFL player to help others but you don’t need to be a professional athlete or celebrity to make a big difference in someone’s life. Do you have any tattoos that relate to your work? “Heart of Gold” is tattooed on the left side of my chest. Whether in sports or life in general, it’s not about how fast you are, it’s about having heart. I believe in doing the right things for people and having a heart of gold.